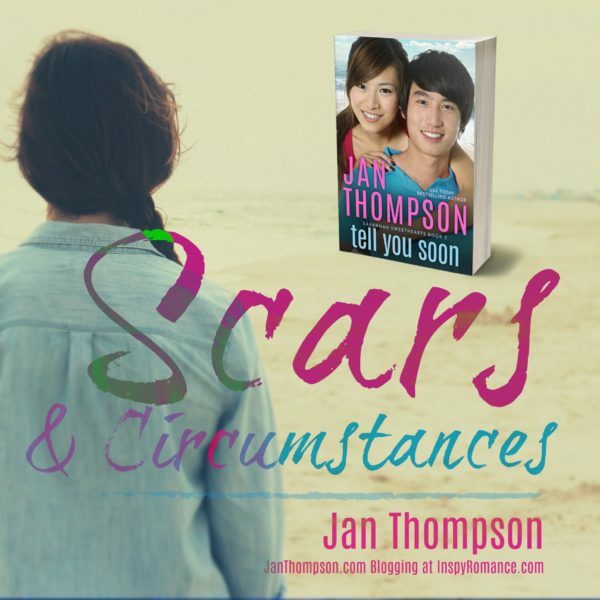 Do you have a scar that you consider unsightly, something you would hide from the world? A physical scar, perhaps? An emotional scar? Both? In one of my Savannah Sweethearts books, Sabine Hu has both physical and emotional scars. Three years ago, she was in a car wreck that killed another passenger, crushed her legs, and destroyed her modeling career. After many surgeries and recoveries from those operations, Sabine has finally gotten back parts of her functional life. She has come to the point of no longer needing a cane to walk. Is she bitter? After all, Sabine was only one of the passengers in the vehicle, with her private investigator sister at the wheel. Sabine was not at fault. But she bore the most pain for it, while her sister walked away unscathed. Nonetheless, for three years, Sabine hasn’t worn shorts or knee-length skirts in public. She had almost always worn long pants or ankle-length skirts, all in her attempts to hide the scars up and down her once-gorgeous legs. She expects to hide her legs for the rest of her life. Sabine’s assumption is that she has adjusted to her situation in life. Little does she know that her heart needs a bit more healing. In this case, it’s not a matter of whether she wears modest clothes to hide her disfigured legs, but a matter of her own acceptance of what God has allowed in her life, and to be bravely unashamed of her scars. Sometimes God uses circumstances to deliver us and take us to the next step in life. That is one of the undercurrents of Savannah Sweethearts Book 2. While the storyline itself is not about Sabine’s scars per se, it is through her daily job as a real estate agent and her new encounters with her sister’s business associate, Aidan Ming Wei, that God works in Sabine’s heart to empower her to overcome her emotional shame. Do you let God deliver you from your scars? “Not that I speak in respect of want: for I have learned, in whatsoever state I am, therewith to be content” (Philippians 4:11). She wants to fix up his beach house and move on. He wants to fix up her heart and move in. A Christian beach romance with suspense, TELL YOU SOON is book 2 in my Savannah Sweethearts series of sweet, clean, and wholesome multiethnic contemporary Christian romances celebrating faith, hope, and love in Jesus Christ. Sabine Hu’s legs were crushed in an auto accident three years ago, ending her modeling career. Today she walks without a cane, is back in heels, and has found a new job as a real estate agent selling houses in Savannah and on Tybee Island. She keeps to herself and stays in the background, unlike her high-profile sister, Helen, whose fame as a private investigator is constantly in the news. Sounds like a fantastic book! Thanks for the blurb! Thank you! Hope you’ll enjoy reading Sabine and Ming’s story! Hi Jan, thanks for sharing Sabine’s story. Letting God deliver ones’ scars is easy to say, but not always easy. I think it is often a daily request and surrender. Amen re: surrender. I agree it’s not always easy! It’s harder if we can see the scars every day. I remember when I had a knee problem and oh boy it was painful for days and it was a constant reminder that I needed to rely on God every single day to just be able to walk! Hi Jan! While I have a few small physical scars – one near my ankle and one on my knee, the emotional scars are more difficult to surrender. Letting go and letting God take control. Thanks for sharing Sabine’s story. I love the name Sabine, have a wonderful German friend with that name. Such a musical ring. Best wishes and Happy Writing. Thank you so much! I like the name too! Yes, indeed re: emotional scars. Sometimes the “phantom pains” can remain the rest of our lives. It’s always a good reminder to rely on God. I love your books! This one sounds like it will be awesome too! Thank you very much! I hope you enjoy reading TELL YOU SOON! I didn’t want to say too much about Sabine’s sister in this blog post, but Helen Hu appears at various times across my other series. :-) And Mama Hu… She’s fun to write about. Sabine is the only down-to-earth person in the Hu family IMHO! This one looks like a unique and interesting book. Thank you! Hope you enjoy reading it! Your book sounds very good! Thank you! This series has 11 books altogether (10 books plus a prequel). Sounds like an intriguing story. Sometimes I feel sorry for our characters and wish we could be nicer to them. But then, there would be no story. Thank goodness for happily ever after. I look forward to reading it. When I was a teen I wore long pants and long sleeves to cover severe infected eczema and the scars from that. I have a large scar on one leg from a 9 inch laceration. At some point in my 20s I was in a much better place physically and emotionally and spiritually. I realized God loved and accepted me the way I was. I started wearing shorts and short sleeves. It was really freeing. That’s cool! Thank you so much for sharing your personal experience, Diana. God does look on the inside of us rather than the outside. I’m glad you were able to be yourself and wear comfortable clothes, whether long pants or short sleeves! I hope you enjoy reading Sabine’s story. To be sure, as I mentioned in my blog post, the story is not about her scars per se. Sabine is a brave woman, and I won’t tell you what happened to her in the story (and to her mom, Mama Hu). And there is a cameo appearance. Woof. I won’t say more LOL!